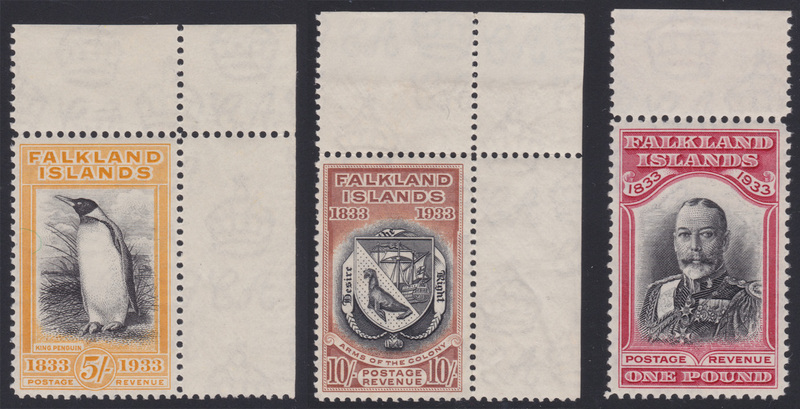 A lovely consignment of Falkland Islands in several sets culminates in these three stamps from the 1933 Centenary. Lot 1107 Falkland Islands #74 1933 5sh Centenary Pictorial, mint never hinged, fresh colour and very fine, with sheet selvedge at top and right. Catalogue value is for hinged only, with never hinged worth a significant premium. Scott CV$900. Lot 1108 Falkland Islands #75 1933 10sh Centenary Pictorial, mint never hinged, with fresh colour and very fine, with sheet selvedge at top and right. Catalogue value is for hinged only, with never hinged worth a significant premium. Scott CV$800. Lot 1109 Falkland Islands #76 1933 £1 Centenary Pictorial High value, mint never hinged, with deep, fresh colour and very fine, with sheet selvedge at top. Only 2721 sold and now extremely scarce in this pristine condition. Catalogue value is for hinged only, with never hinged worth a significant premium. Scott CV$2,400.